Extravehicular activity (EVA) is when an astronaut or cosmonaut gets out of a spacecraft in outer space, then gets back in. "Extravehicular activity" usually refers to a spacewalk outside a spacecraft orbiting the Earth, but can also refer to a moonwalk on the surface of the Moon. Three Apollo astronauts made spacewalks between the Earth and the Moon while their spacecraft were returning to Earth. Astronauts from Russia, the United States and China have done EVAs. Alexey Leonov, a cosmonaut from the Soviet Union, made the first spacewalk on March 18, 1965. He spent 12 minutes outside the Voskhod 2 spacecraft. 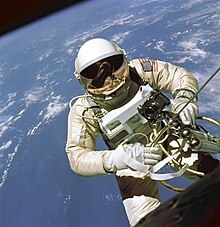 The first American to make a spacewalk was Edward H. White, II, who spent 36 minutes outside the Gemini 4 spacecraft on June 3, 1965. The first moonwalk was made by Neil Armstrong and Buzz Aldrin on July 21, 1969 (UTC), during the Apollo 11 trip to the Moon. This first Moon walk lasted for 2 hours and 32 minutes. Twelve human beings have walked on the surface of the Moon. Cosmonaut Sergey Volkov works outside the International Space Station on August 3, 2011. In 1973, astronauts made spacewalks to repair Skylab, the first space station sent into space by the United States. Skylab had been damaged while it was being launched into space. Many spacewalks were made to build the International Space Station (ISS). Spacewalks are still made to maintain the ISS and fix it when there is a problem. ↑ 1.0 1.1 1.2 Portree, David S. F.; Treviño, Robert C. (October 1997). "Walking to Olympus: An EVA Chronology" (PDF). Monographs in Aerospace History Series #7. NASA History Office. Retrieved July 30, 2015. Wikimedia Commons has media related to Extravehicular activity. This page was last changed on 17 August 2015, at 02:36.